I am going to be brief today, it is Saturday and we have to enjoy the real world! Just in case you can't quit the habit I leave you this lamp, an elaborate example of Catalan Art Nouveau or Modernisme hanging inside our famous concert hall Palau de la Musica. 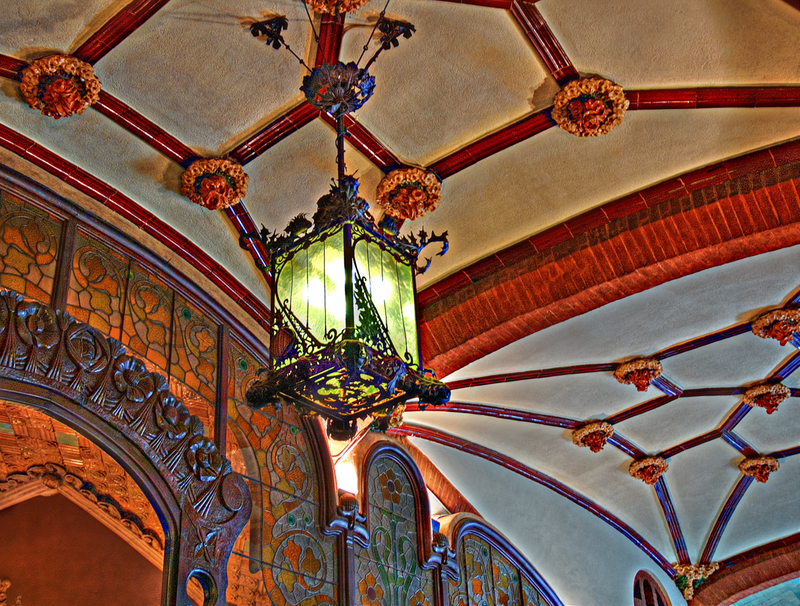 Although beautiful as such, I thought it was better to use some tone mapping with an HDR program and thus enhance the design in the ceiling, the glass, the wood and of course the lamp. Have a nice weekend! Gorgeous photos....I love this one especially! Such a beautiful lamp. Some details like these that we can see in buildings in Barcelona, I guess we can only find this beautiful and creative mix of colors and shapes in Barcelona!